While the Swarovski Shine was launched a year ago at CES, we've heard precious little about Misfit's semi-precious smart jewellery since. But Swarovski's back and set to expand its line-up of bejewelled bands, including the long-waited solar powered fitness tracker. We met up with the Robert Buchbauer, the company's CEO, at CES in Las Vegas and he showed us a host of new coloured designs which Swarovski has been experimenting with, including stones designed by no less than Christian Dior and Jean-Paul Gaultier. "One of our core competences is colours and effects that you see very well applied in a variety of products," Buchbauer said. "We created one stone in the 1950s with Mr Christian Dior himself." Compared to the frenetic pace of development in the tech industry, Swarovski appears happy to play the long game with its smart jewellery. It is not planning to release its next two colours of the Swarovski Shine until autumn 2016 but Buchbauer did reveal that the solar version of its tracker could get a release in time for Christmas. "We have improved [the solar powered Shine] and now it can absorb light for 15 to 20 minutes and last much longer than before," he said. "By the end of February we will complete all of the necessary tests and then we will decide a launch date. Hopefully it will be launched by the end of this year." "In the US we had a soft launch in 20 - 25 stores and the sales record or quantity sold was one of the highest, even compared to our proud jewellery collection. Imagine, there is no awareness, no advertising - we just put it in the store. It was a natural performer," explained Joan Ng, Swarovski's senior vice president of product marketing. "I think the overall idea is there. Once the ball starts rolling you become addicted. It is a positive kind of addiction and ideally it's self-explanatory. However, it took us six months to train our sales staff around the world, because we take this partnership and this collection so seriously." Despite there being a Misfit Shine under the hood, the Swarovski manages to put the emphasis very much on its design. It's unashamedly blingy and while certainly not everyone's cup of tea, it's fully aimed at Swarovski's existing customers – making it one of the boldest, most fashion-forward wearables ever developed. Buchbauer says that compared to the smartwatch industry, Swarovski has taken the time to develop both the design and user experience. "I think the smartwatch industry was very quick as a whole, very quick in announcing things. And to what extent they have actually delivered is a different story," he said. "I just tried another smartwatch from one of the producers out here [at CES] and it's a pain to use because it wouldn't sync with my phone and in the end I just put it in a drawer and moved onto the next generation. Those are the challenges that are still out there," the CEO continued. "On a positive note it's great that the industry reacts because it gives the consumer choices and also gives us healthy competition, all of us in the industry." So what's the key to making a great fashion wearable? "I think simplicity is important. I think it's important that it becomes a proprietary product for us, more than gluing a few stones on an existing device," he said. "We develop those stones specifically for that product so that they become an integral part of it. You have to stick to your principles. You cannot just buy something off the shelf or some producer's pocket. You have to produce something that is in line with your quality policy and expectations." 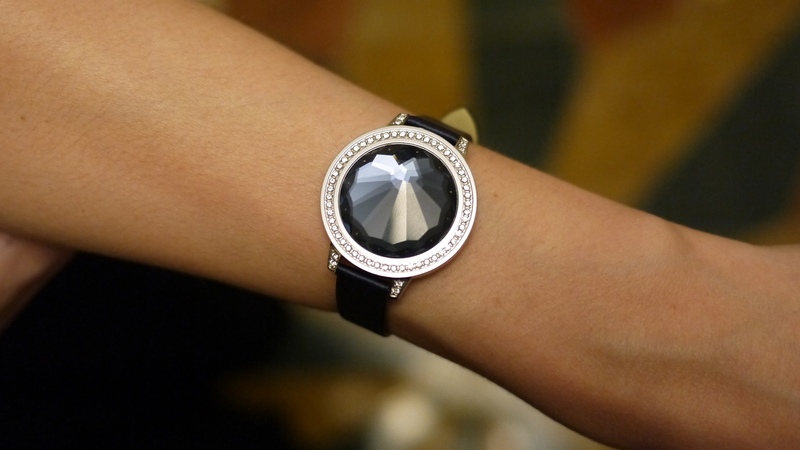 The tech inside the Swarovski Shine is built by Misfit, which has recently been bought out by Fossil. And around the table of Swarovski representatives is Preston Moxcey, VP and general manager of Misfit, who highlighted how the female wearable tech market is still sorely under-represented. "The interesting thing is that there are so few things out there for women, we know specifically on the Fossil side and for Misfit as well. Very few focus on women compared to the amount of demand that is there from female consumers," he said. The Misfit VP notes that slowly but surely, wearable tech is improving to enable manufacturers to extend the range of how these devices look, feel and behave. "That includes the materials you're able to use and the finishes you're able to achieve. Being able to use aluminium and leather - things like that. "It's not a question of whether women are interested, it's a question of - can we make things that look good enough so people won't feel like they're compromising?"